Tonight at 8:20 p.m., the world champion Philadelphia Eagles officially open their 2018 season against the Atlanta Falcons at Lincoln Financial Field. We don’t know about you, but we’re still amped up about last February’s big win! But if we must turn the page on a new season, we’re going to do so library-style! Want to make something tasty for game night? The Free Library Culinary Literacy Center recommends these buffalo chicken and cheese balls, perfect for fall and football! Pre-heat oil to 350 degrees F.
Pick meat from the rotisserie chicken and place in large mixing bowl. Please do not use skin. Add the hot sauce, cheeses, salt and pepper (to taste), and green onions. Toss to combine. Roll the mixture into balls the size of golf balls. Place balls on a lined sheet tray and place in freezer for 45 min- 1 hour. Place flour, eggs, and breadcrumbs in three separate bowls. Cover each ball with flour, then egg, then breadcrumbs (shake off excess). Gently place the balls in the hot oil in batches. Do not crowd the vessel. Cook until golden brown. Take out balls when finished and place them on paper towels to drain oil. (You could also use a wire rack). Serve the balls while hot. You could use any dipping sauce to your choosing. While you count down the minutes until kickoff, brush up on your Eagles trivia in our Knowledge Base, and browse some sports history in our digital collections! We also recommend borrowing a book or movie about the Birds – find the perfect one with the help of this catalog list and your library card! We also hope you’ll mark your calendar for Sat., October 13th at 2:30 p.m., when five-time Pennsylvania Sportswriter of the Year Ray Didinger visits the Parkway Central Library for a free event in conjunction with his book The Eagles Encyclopedia: Champions Edition, updated to reflect the quintessential underdog season that led to the Eagles’ Super Bowl LII victory. He'll be joined that afternoon by Mark Leibovich, author of Big Game: The NFL in Dangerous Times. Fly, Eagles, Fly! E-A-G-L-E-S EAGLES! 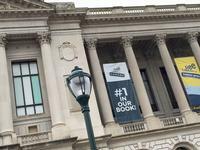 Add a Comment to Celebrate the Return of Your World Champion Philadelphia Eagles with the Free Library!